Among the eight figures in the the lodging-house composition, only three have undistorted, natural visages: the two constables (in uniforms similar to those in Plate VII of the previous series) and the Drunkard's son, no longer a diminutive waif, but a young adult. Through this strategy of caricaturing most of the figures in the scene Cruikshank emphasizes the sheer alienation of the youth who, having committed larceny while under the influence of alcohol, finds himself rousted out of bed and handcuffed in the middle of the night as the partially awake manager and his wife watch dispassionately. 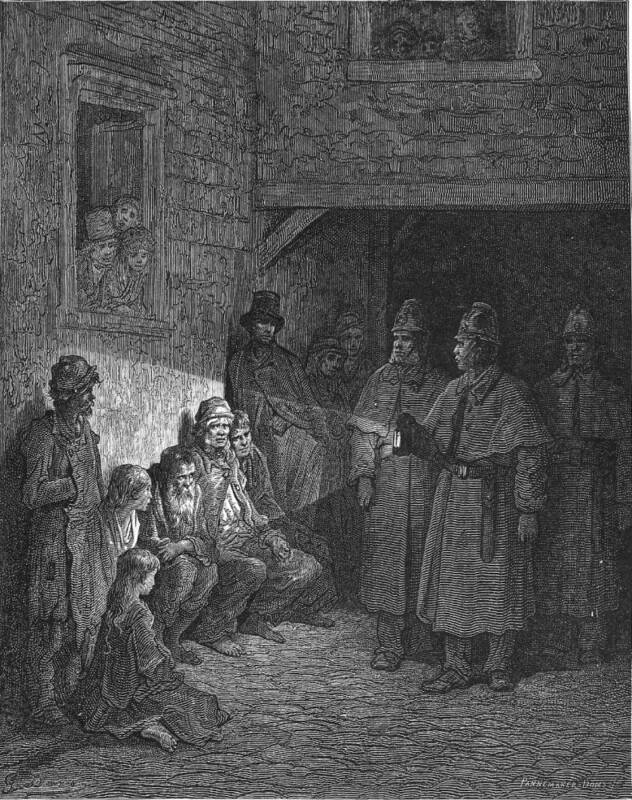 The other men in the dormitory respond to the interruption of their sleep with individualised emotions — anger, disbelief, and surly indifference — while the police, with professional thoroughness, betray no emotion as they shine the bull's-eye lamp on the thief's face to verify his identity prior to cuffing him. Although the situation nominally resembles that in Cruikshank's more animated scene involving the apprehension of a petty criminal in Covent Garden, A Pickpocket in Custody (1839), in the earlier illustration the numerous bystanders scrutinize the scene with greater curiosity (and many with levity), and the police wear different uniforms from those in the later engraving (perhaps reflecting actual changes in the uniform over the decade); moreover, Cruikshank creates an effect in the large-scale 1848 glyphograph very different from the situation comedy of that earlier steel-engraving. As Vogler remarks of the nocturnal scene in the three-penny lodging house, “the bleary-eyed porter has just led the police to the cot of the drunkard's son. They awaken and arrest him. 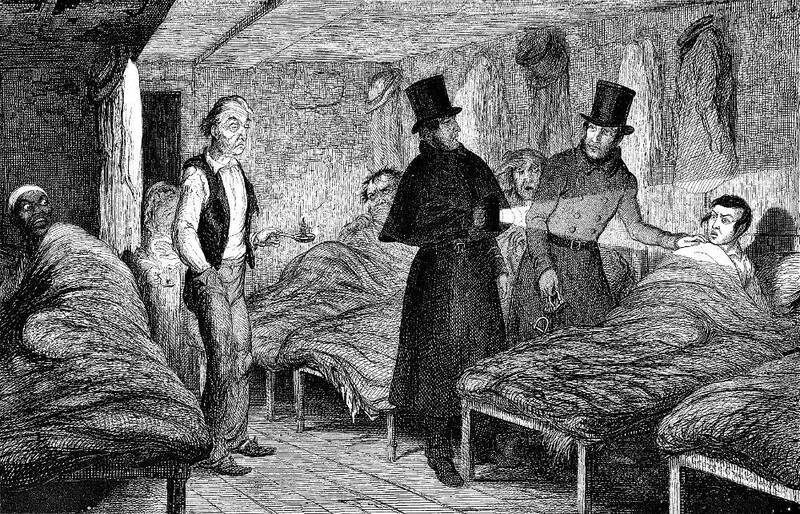 The low ceiling and tawdriness and squalor of the lodging house contribute to the mood of surprise and shock. As with the final plate in this series, the general atmosphere of this composition is more significant than its small details; unlike Hogarth's, Cruikshank's details sometimes do not contribute to the narrative content of the plates” (p. 161). The illustrator has created a gap in the narrative sequence that he demands the viewer fill with such conjectures as the nature and circumstances of the crime, the youth's confederates, the victim, and the circumstances under which the police have learned of the young man's whereabouts. Cruikshank uses caricature to direct the viewer's sympathy towards the young criminal through his having distorted the faces of the manager, his wife, and the other sleepers, for the viewer will not tend to identify his or her own humanity with a grotesque. As John Harvey remarks in his examination of Cruikshank's use of line in the 1847 and 1848 series, wishing the viewer to regard the picture as a scene in a domestic tragedy, the artist has been "so bent on suppressing vulgar caricature in the faces, that he suppresses character and life, and the figures are mostly dummies" (150).​ Here, the faces of the "dummies" force the reader to focus on the police and the culprit equally. The setting, too, differs somewhat from others in the two series in that it lacks Cruikshank's customary attention to background detail, as he subordinates everything in this fourth plate to the visage of the startled son. However, the bleary-eyed landlord and the frazzle-headed inmates, whom the constables have just awakened, redeem the illustration with a touch of the old Cruikshank character comedy. Whereas in illustrating Dickens Cruikshank had to attend to the details in the text and shape his conception of the drinking scene accordingly, much to his delight in his project for the Temperance Union he could control the storyline in his own "wordless" novella, The Drunkard's Children. To provide narrative continuity from scene to scene in his eight-picture telling​ of this sordid tale, Cruikshank had to rely only on repeating characters since, unlike his strategy in The Bottle, he could not simply repeat a single room to develop such coherence. Moreover, in the 1848 sequence he has developed five highly crowded scenes, so that the viewer sometimes has to search for the drunkard's son and daughter. In this sequel, Cruikshank employs a number of settings associated with proletarian London: the gin-palace, the beer-shop, the dancing-rooms, the three-penny lodging house here, the courtroom of the Old Bailey, a lockup, the infirmary aboard a prison hulk, and one of the spans of New London or Waterloo Bridge. In the next scene, at the criminal court of the Old Bailey, the Drunkard's son stands trial for larceny, and receives the sentence of "Transportation for Life." As Richard A. Vogler points out, The Drunkard's Children has “scenes of lower-class Victorian life that were seldom portrayed in the arts of the period. No doubt Gustave Doré was fimilar with Cruikshank's designs before coming to England to create his great illustrated work London: A Pilgrimage . His scene in the threepenny lodging house may have been directly inspired by Plate IV of this suite” (p. 16). 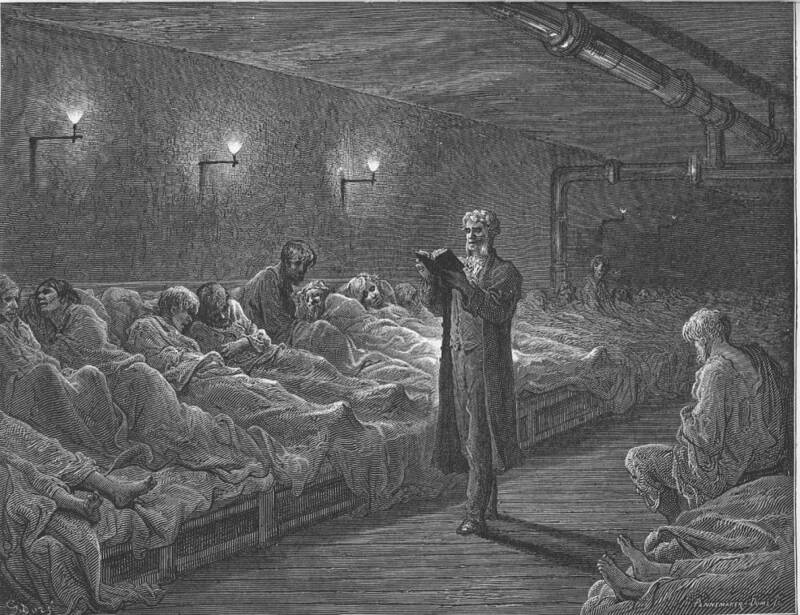 Although one can see the influence of this plate on such Doré illustrations as Scripture Reader in a Night Shelter and The Bulls-Eye" in Blanchard Jerrold's London: A Pligrimage (1872), Doré establishes an ambience or atmosphere in his illustrations, whereas Cruikshank utilizes his illustrations to construct a depressing narrative. In the Cruikshank illustration of the night scene in the three-penny "lodging house," the two uniformed "Bobbies," members of the Metropolitan Police Force, visit the unsavoury location in order to apprehend the thief. Once again in the lives of this unfortunate family the police must intervene to maintain order and combat crime — they make a similar appearance in The Bottle in the aftermath of the Drunkard's murdering his wife in an alcohol-fuelled rage, The husband, in a State of Furious Drunkenness, Kills His Wife with the Instrument of All Their Misery (Plate VII). Two Scenes of Urban "Refuges" —​ ​ A Sign of the Hungry Forties: "Are There No Prisons, Are There No Workhouses?" Jerrold, Blanchard, and Gustave Doré. London: A Pilgrimage. London: Grant & Co., 1872. Pritchett, V. S. "A Fine Rough English Diamond: A Review of Graphic Works of George Cruikshank, selected and with an introduction and notes by Richard A. Vogler. Dover Publications, 168 pp., 279 illustrations, $7.95 (paper)." The New York Review of Books 12 June 1980. Pp. 5-8. Sutherland, John. "Lloyd, Edward." The Stanford Guide to Victorian Fiction. Stanford: Stanford U. P., 1989. P. 380.